Over the last three months, the Trump administration has rocked the global trade landscape by imposing tariffs on international steel and aluminum imports. Investors are pouring money into any and every U.S. steel stock, hoping to profit from the chaos. United States Steel Corp. (NYSE: X) is up 68% over the last year. Instead, we're looking at one of the best steel stocks on the planet. It's one that can block out the trade war noise coming from Washington and produce profits for shareholders no matter what happens in the global trade landscape. It's a stock that was just upgraded to "outperform" by Credit Suisse (Nasdaq: USLV) thanks to its excellent business fundamentals. And it just hit a perfect Money Morning VQScore™, making it a great buy right now. U.S. President Donald Trump is talking tough about steel tariffs, but they could be nothing more than bargaining chips for better trade deals. Companies relying on tariffs simply aren't good plays. In March 2018, the Trump administration announced that it would impose a 25% tariff on global steel imports. The announcement caused a dramatic rise in market volatility and sent American steel stocks soaring. While the White House's policy certainly boost the profits of American steel companies, the policy is unlikely to stick around. You see, there is a high likelihood that the White House is using American steel tariffs as a bargaining chip in international negotiations that will be repealed once they've outlived their usefulness. Already, President Trump has repeatedly indicated there are several developments that would bring him to lift tariffs. These include the renegotiation of NAFTA, a new Chinese trade deal, and a more balanced trade relationship with the European Union. In other words, the White House is not firmly committed to bolstering the steel industry indefinitely with tariffs. In fact, President Trump is likely to abandon them the second he gets what he wants. That makes investing in U.S. steel right now a hefty gamble, even for the boldest investor. As a result, the boom in American steel stocks – and Wall Street's gains – are borrowed time. That's why our favorite steel stock to buy steers clear of politics and sticks to profits. 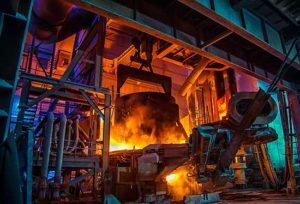 Because of its relationship to the global steel industry, this steel stock will avoid significant fallout when tariffs are repealed. It also has Money Morning Stock VQScore™ of 4, indicating that it's primed for significant gains in the near future.